Looking for a stunning way to create a buzz around your trade show booth with a one-of-a-kind display that is sure to outshine the competition? Take advantage of custom illuminated table covers to pique the interest of passersby at your next major event. Create a refreshing visual promotional presentation by utilizing one of these personalized stretch fabric skirts to spice up exhibits, retail floors, lounges, and private functions. 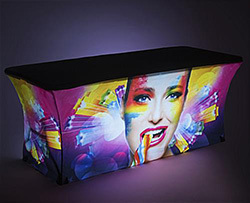 Custom illuminated table covers feature quality graphics printed in house on high grade polyester-spandex blend fabric. Showcase your business' logo, image, or personalized marketing material with vibrant inks amplified by luminous LED curtain lights with magnetic hooks that attach to the legs of any standard folding 6' or 8' fixture. 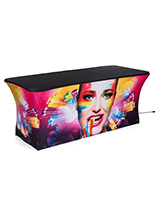 A custom illuminated table cover is a powerful advertising tool in the front and provides ample storage with tightly fitted throw openings in the back. Easily tuck extra stock, supplies, or personal items beneath the booth and out of view from the public. These promotional tablecloths with custom printed graphics are machine washable, wrinkle-resistant, and will enjoy a lasting lifespan with through years of trade show circuit use. A custom illuminated table cover can significantly improve a business' presentation. Use at events or for in house displays with vibrant LED curtain backlights. The energy efficient cold white lights are the perfect brightness to enhance any throw graphic. Despite the brightness, these lighted displays stay cool through prolonged use. Featuring simplified construction and a 10' power cord, the LED curtains are easy to assemble and move between events. Use an illuminated table cover to make a lasting visual impression that guides passersby toward your business' booth. merchandise presentation. These luminous tablecloths with personalized graphics are the ideal way to represent your business at an upcoming trade show or event. What makes illuminated glow table covers the right choice for events? Stretch-fit tablecloths are made with a durable polyester and spandex blend. This type of fabric remains wrinkle-free while maintaining a professional and clean appearance. Small cups are sewn to the bottom corners and allow the cover to loop beneath each leg, making these covers adaptable to different sized tables. 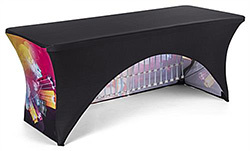 Each illuminated table cover fits any standard six or eight-foot folding tables. It will never be difficult to find a compatible fixture at any event! Or, check out our selection of affordable folding event tables and take one with you! These booths, when coupled with a stretch-fabric tablecloth provides ample room to display merchandise on top as well as space for extra goods below. Utilizing dye sublimation printing, a type of heat transfer process, the inks used become vibrant, permanent, and safe for washing machines. In short, you won't have to worry about colors fading with each cleaning or diminishing through multiple events. We offer many printing options to suit your needs, including centralized front panels and full-bleed designs. Get creative and upload professional photos, business logos, and color-matches. Use this table accessory as a transformative tool to create spectacular marketing displays. Each rectangular fixture features an under-table LED array that creates a glow effect that illuminates the stretch spandex covers. Multiple lighting options mean that this type of custom covering is as much at home at a trade show or promotional event as it is when used on a DJ table at a party, afterparty, or other social gathering. The LED glow lights and contoured stretch material are a sure way of making this type of fixture the center of attention. Something as simple as dressing up a trade show booth with a backlit table cover can significantly impact the success of your next showing. A decorative overlay can energize a presentation, send a powerful message, and solidify your business' place at any event with a dominant feature. Exhibitors use these covers to entice passersby to approach your booth and ask about featured merchandise. Compliment these trade show table covers with exhibit booth backdrops, especially those with custom printing, to maximize branding potential at your next event. Shop a selection of thousands of promotional trade show fixtures on Displays2go.com, including all-in-one bundles, to create a visually stunning presentations that are sure to outclass the competition!